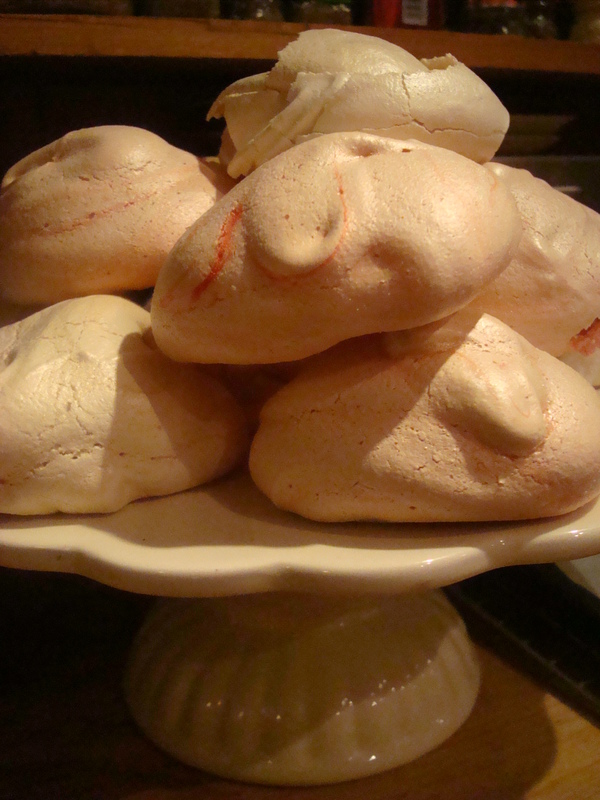 Left-over egg whites…the best meringue ever! I hate to waste anything, so having found myself with 8 leftover egg whites following the weekend’s supper club I decided to make a huge pile of meringues for Sunday dessert. Nothing beats home-made meringue. Supermarket meringues are a waste of money, usually dry and cardboard like, brittle and without the marshmallow softness characteristic of the freshly made kind. Even those labelled ‘luxury’ or ‘the best’ fail to live up to the title. I have experienced exceptionally good, shop-bought meringue, the kind found piled on ornate dishes in the shops around Borough Market, or other similar foodie places…but these are of course tend to be specialist Italian deli’s or confectionary shops the likes of which are non-existent in North Wales. Consequently I make my own. 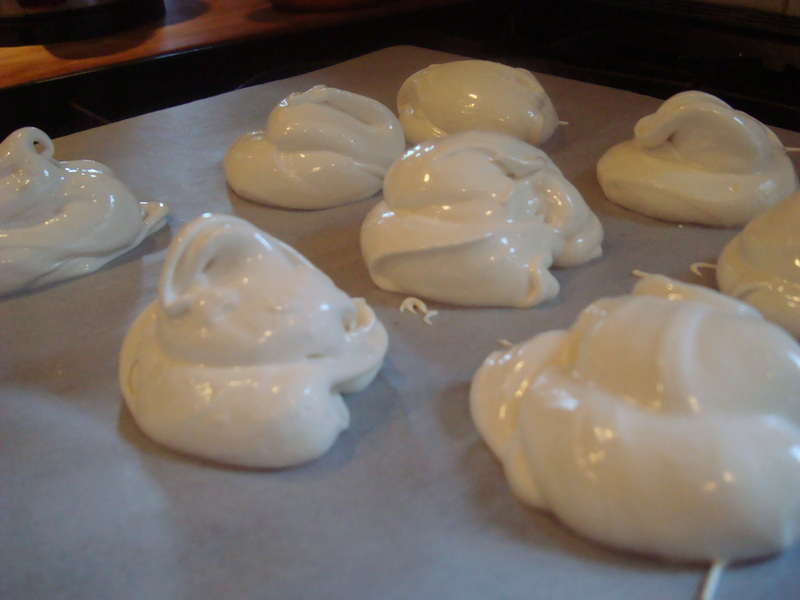 My favourite meringue recipe is from Nigella’s ‘How to be a domestic goddess’ book. In this case the phrase ‘don’t fix it if it’s not broken’ fits perfectly. The outer part of the meringue crumbles, melting in the mouth, as it gives way to a soft, gooey marshmallow centre. Its almost a shame to crumble them up for Eton mess, a family favourite and as synonymous with summer as summer pudding, or strawberries and cream. To make you need, 8 large egg whites (I’d used the yolks the day before for the Tiramisu), a pinch of salt, 500g caster sugar, 2 teaspoons of cornflour, 1 small teaspoon vanilla, 2 teaspoons of white wine vinegar. Preheat the oven to gas mark 4 (180 degrees C). Whisk the egg whites with the salt until you reach the firm peak stage (but not too stiff). Whisk in the castor sugar a spoon full at a time until you are left with a bowl of smooth, glossy meringue. Sprinkle over the cornflour, vanilla and vinegar and fold or gently whisk into the mixture. At this stage the kids intervened and insisted we add different colours, so we split the mixture into 3 bowls and coloured some a very pale pink and some mint green. Line a couple of baking trays with baking paper or parchment and spoon the meringue into circles, piles, or one big meringue case. We made small heaps. Put into the oven and turn it down to gas mark 2 (150 degrees C), bake for 30 minutes then turn off the oven and leave for a further 30 minutes. Take out and leave to cool before transferring to a wire rack. For the Eton mess whip 500ml double cream with some vanilla and a tablespoon of icing sugar, or two if the fruit you are using is very tart. We used Tayberries which are like a bigger, sharper Raspberry, but you can use any combination of summer fruit. Stir a punnet (around 250g or more if you like) into the cream. Crush a couple of meringues and gently stir into the fruit cream mixture and serve immediately. I have to say we are none too accurate with our measurements, we just add fruit and meringue in random quantities until it’s the way we want it…which for the kids is usually twice as much meringue as the recipe suggests.